Get a fast and reliable scanning performance with the Epson WorkForce DS-70000 Document Scanner. Built with 600 x 600dpi resolution and CCD sensor, this scanner produces a supreme soft copy quality. It comes with 16-bit Color Depth and 8-bit Grayscale Depth that gives you impressive image quality. You also have the option to connect to a computer�s USB interface that allows instant connection with your PC and other devices. This device is compatible with Mac and PC operating systems. 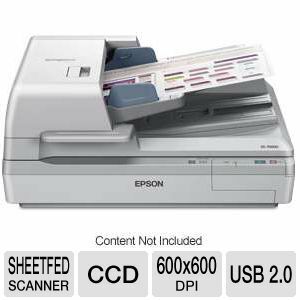 Order the Epson WorkForce DS-70000 Document Scanner right away!